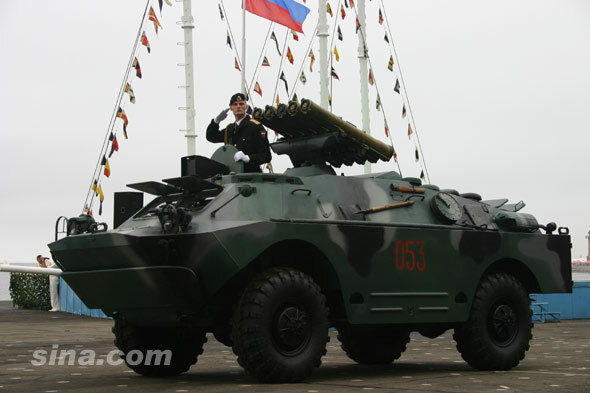 Russian BRDM-3 with AT-5 'Spandrel' missiles. So another unit painted, actually, bonus time, 2 units. Back when I ordered up a tonne of modern soviets in 15mm scale, I got 4 BRDM-2 recce vehicles (see below) and was trying to figure out how to incorporate them into my Team Yankee force... when I realized the above picture.. that is the same chassis, but with the AT-5 Spandrel's up top. Perfect! 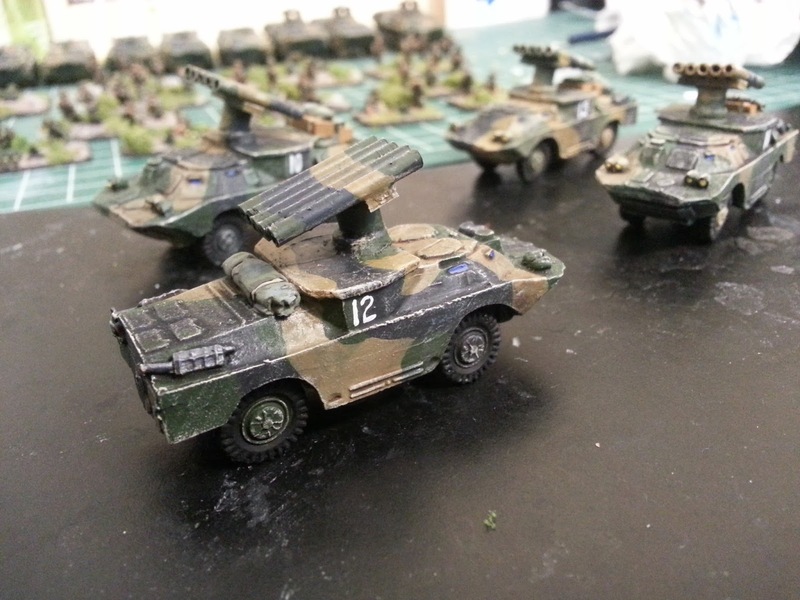 So how could I turn these into BRDM-3s with AT-5's? The answer was HOURS of cutting lengths of brass tube. 5 tubes per. Plastic accessories and tank hatches make up the mount. Turned out pretty good I'd say. 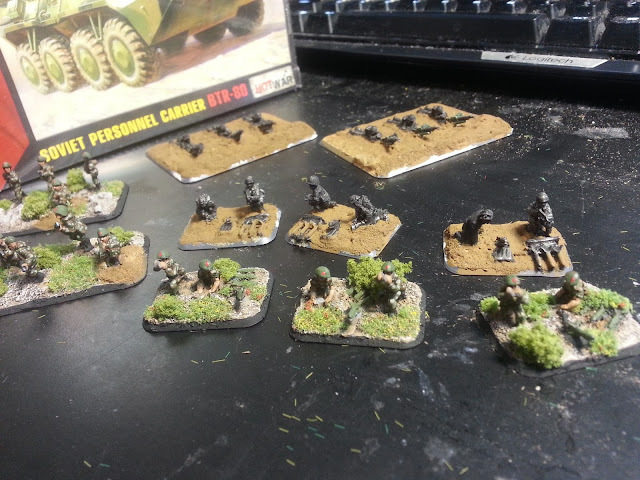 I also had some infantry stands to re-organize / make to finish my Motor Rifles. 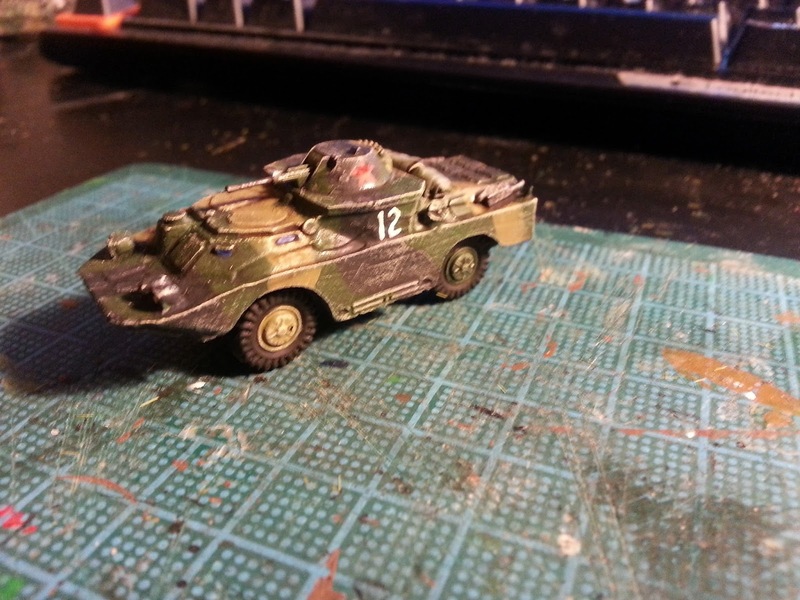 Oh and buy 3 more BTR-80s from Zvezda! Note, I am using AT-3 'Sagger' TOW teams as my RPG's!! 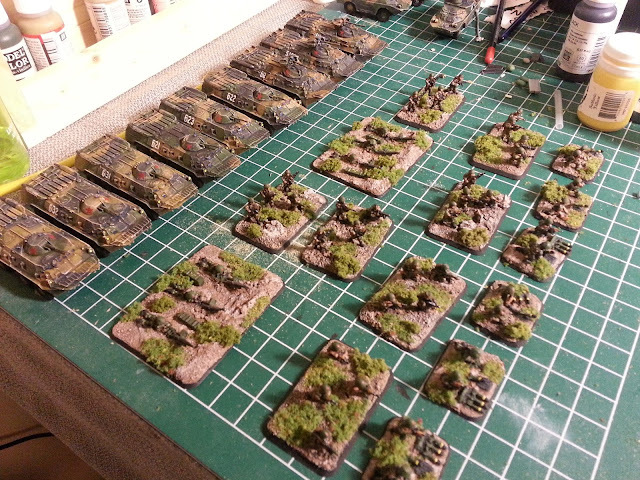 ..the two giant based HMG sections..and the BTR's in parade formation..
..That's a lot of painting for a unit whose sole job is to dig in on an objective.... ah well, they look good though! Well.. that's another two units down. 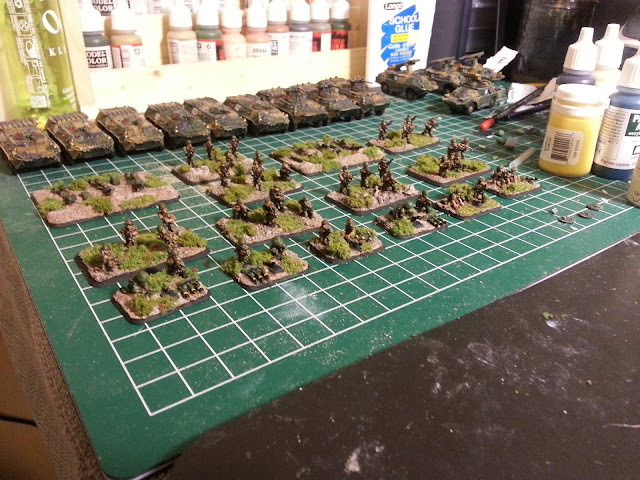 I've already started on another unit, a french Napoleonic Light Battalion (I need to keep up in the skirmisher wars) and have already decided that if Denver Broncos lose in tommorow's super bowl.. that I will commemorate the loss with building 5 plastic Panther's for the upcoming MW tournament..!! You guy's don;t want to see my Panthers in MW?? then GO BRONCOS! 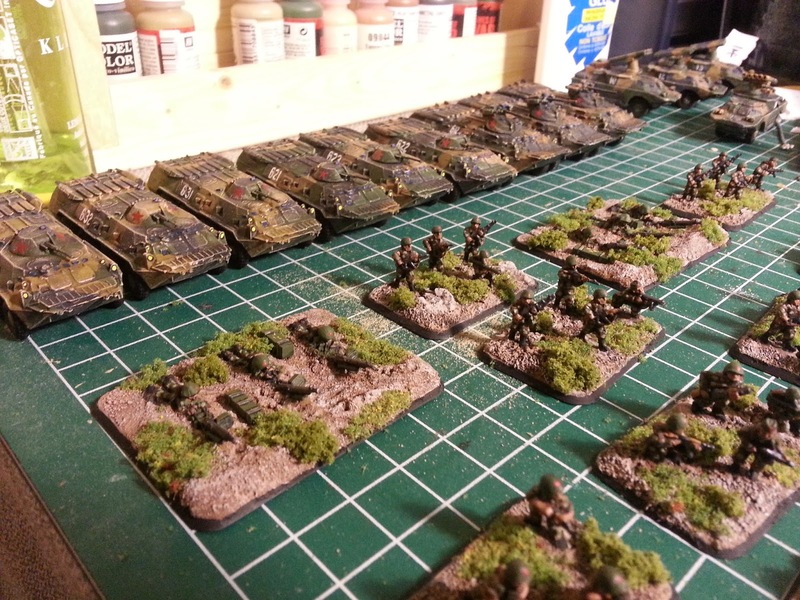 Denis, they look awesome, I can't wait for our forces to square off again! Wait till you see what I'm working on for the USMC. 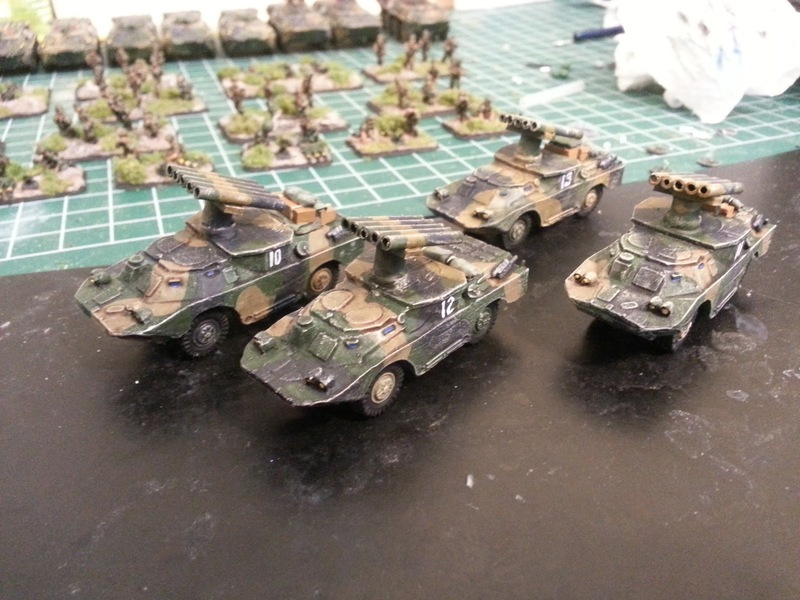 Sea Knights and a Super Huey with Dylan miniguns! Still haven't figured out how they will fit into a game but they look so cool.